of a cloud at the scarlet strike of sunset. Check out our clinic schedule. As always, with horses, there never seems to be ‘still’ moment; however, I decided as a new regimen to take a chair and ‘sit a few’ with my horses. It is wonderful. We call that no agenda time. Awesome feeling! This is so beautiful. It made my heart peaceful. Thank you for your expression that touches our hearts. Thank you for reading along, Diana. Again. You did it again. In the chaos of my life, the tension in my body, the racing of my thoughts, the endless energies of children and weight of choices to be made, everyday, so many times I remind myself to just breathe. Thank you for putting it so beautifully! Happy Birthday! Wishing you farm breathing… thanks, Joan. Considering the picture matter, the poem could have been written tongue in cheek. I’m very curious about the outcome of the encounter you have photographed. Hope it was pleasant. 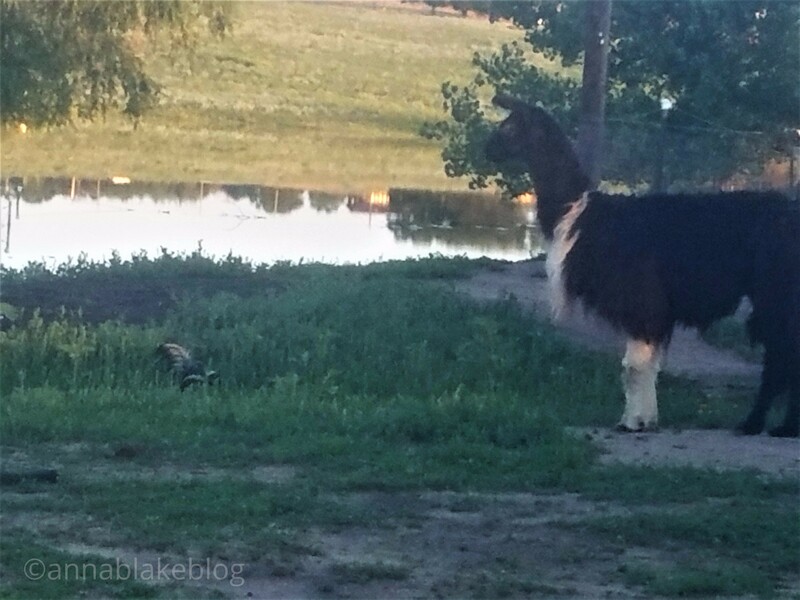 Yes, curious… she is a elder llama, and she and I both like to say what if this isn’t wrong…. she watched as the skunk left peacefully. This made me breathe again. Lovely. Well, that woke me up! Thanks!